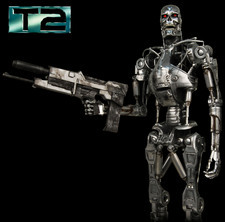 Just in time for the release of Terminator: Salvation, NECA is proud to unveil a brand new series of 7″ figures based on James Cameron’s groundbreaking T2: Judgment Day! 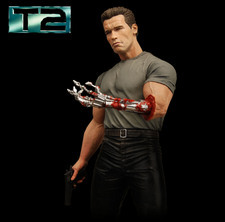 All three figures feature new editions of the T-800, including two new Arnolds with interchangeable heads! 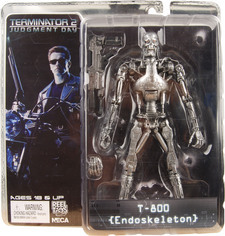 The still-terrifying Endoskeleton has a newly tooled head and improved articulation, with over 20 moving parts and a Plasma Rifle accessory. 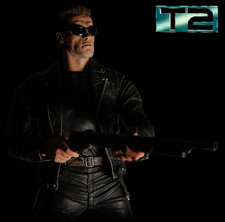 A leather-clad Pescadero Escape T-800 comes with a ball-jointed neck, shoulders, elbows and wrists and is packing heat in the form of a Winchester Shotgun. 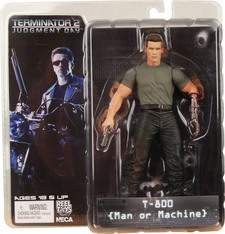 And last but not least, the Man or Machine T-800 boasts a ball-jointed neck and shoulders, as well as swivel biceps, waist and boots, and a pistol, in case Robert Patrick should happen along. 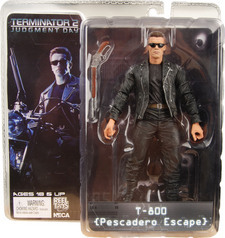 A 12″ version of the Pescadero Escape T-800 will be released in June, and the 7″ figures will be back in late summer/early fall with a whole new second series!